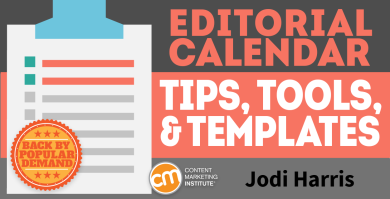 Editor’s note: Because editorial calendars continue to be the cornerstone of content marketing planning, we’ve updated this 2016 post by Jodi Harris. You can find the 2017 post here. Is there anyone in the digital marketing industry these days (or any industry, really) who thinks that they have their jobs completely under control? No matter how good we are at what we do, or how many years we’ve been doing it, we all seek the elusive “better way” to accomplish our everyday tasks – new tools to explore, new techniques with which to experiment, new information to take into consideration – innovations are constantly emerging to help people do what they do in less time, with less wasted effort, and with greater success. Reinvention is practically a commodity we trade these days to keep pushing our digitally enabled society forward. Even the most steady and stalwart of tools in the content marketer’s arsenal – the editorial calendar – has transformed itself over the years, from a simple spreadsheet for tracking what we publish to an essential component for managing the entire life cycle of our organization’s content marketing program. 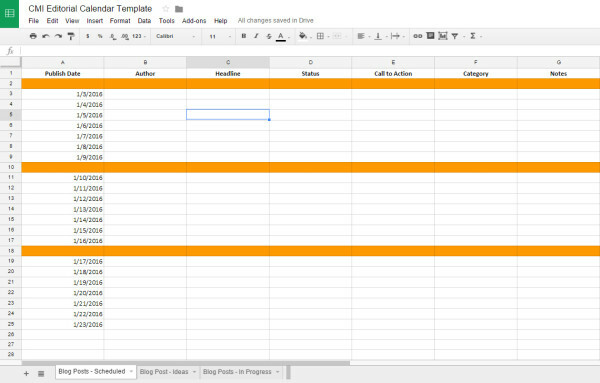 To help you stay in step with the progress our industry has made when it comes to working with editorial calendars, I’ve compiled a set of tips, tools, templates, and takeaways from the annals of the Content Marketing Institute blog. Whether you need to build a new system from scratch or just want a few tricks to make your calendars more efficient and robust, these expert-endorsed resources can put you on the right path to content marketing success. Start by gathering the key content marketing strategy information on which you will be basing your content creation efforts. Your answers to the following questions will help you determine what you need to track in your calendar, as well as help you stay focused on your marketing goals as you plan your content creation. Who are you creating content for? Keeping your target audience top of mind as you create your calendar will be essential for planning how to deliver on its needs through your content marketing. Bonus tip: Developing an actionable content marketing persona can help with this. Why are you creating content? Are you looking to generate leads? Increase your thought leadership? Drive attendance to your events? Your content marketing mission and goals will impact what you publish, where you publish, and how often, as well as how your team prioritizes, organizes, and categorizes/tags its content creation efforts. Bonus tip: Learn how to set attainable goals with this S.M.A.R.T. technique. What skills and resources do you have at your disposal? Whether you have a dedicated in-house team of writers and videographers, a stable of industry pros looking to share their insight, or just a handful of reluctant execs who will need some serious content creation hand-holding, the formats, frequency, and overall workflow you track in your calendar will likely depend on who is writing and where their expertise lies. Bonus tip: If you are looking to increase your resources for quality content creation, follow these tips for hiring great writers. How can you stand out? What unmet industry needs can be addressed with the content you create? What gaps exist in your current content creation efforts – or the efforts of your competitors? What industry events happen throughout the year to which you can tie your content for added exposure potential? Knowing where you can play a lead role in owning the audience’s attention will help you fill your editorial calendar with impactful content that helps you meet your business goals. Bonus tip: Learn to differentiate your business by finding your content tilt. There are lots of dedicated tools on the market that offer a wide range of calendaring capabilities. In addition, many content collaboration solutions have integrated tools that can help marketing teams manage editorial processes. For example, MyBlogU.com founder Ann Smarty says she relies on Trello, a free collaboration management tool, to help her maintain a list of content ideas, set deadlines, and remind contributors when deadlines are approaching. Trello also includes a calendar view that marketers can access as a “power-up” feature. However, if you are not looking to work with an enterprise system, it’s perfectly fine to start out with a simple Excel spreadsheet or a shareable Google Sheet to track your content’s progress through your editorial process. For example, Shanna Mallon offers some suggestions on a quick, easy way to build a content calendar that maps to your sales cycle. It may also be helpful to create a customer journey map to align your content ideas with your customers’ evolving needs. The channels where your content will be published: This can include only your owned channels (such as your blog, Facebook Page, website, YouTube page, email newsletters, etc. ), or you can expand your tracking to include paid and earned channels, as well. Content formats: Is it a blog post? A video? A podcast? An infographic? An original image? To get more mileage from the content you create, you might want to consider repurposing it into other formats at some point. So it’s handy to keep tabs on the types of assets you have on hand right from the start. Visuals: Speaking of assets, it’s important that you don’t overlook the appeal that visuals can lend to your content, both in terms of social sharing potential and overall brand recognition. Tracking the visual elements you include in your content efforts – such as cover images, logos, illustrations, charts – will make it easier to ensure that your work has a signature look and cohesive brand identity. Bonus tip: Need help creating stellar visual content? Try these helpful tools. Topic categories: This helps make your calendars more searchable when you are looking to see about which target topics you already created a lot of content – or which you haven’t covered often enough. Keywords and other metadata, such as meta descriptions and SEO titles (if they differ from your headlines), which will help you keep your SEO efforts aligned with your content creation. URLs: This info can be archived as an easy way to keep your online content audits updated, or to link to older pieces of content in the new content you create. Calls to action: This helps you ensure that every piece of content you create is aligning with your company’s marketing goals. Bonus tip: The CMI editorial team uses a multi-tabbed spreadsheet that’s based on the editorial calendar template below, so that all the various editorial information we track can be found in one document. Click the image below to download your own copy, which you can customize to your team’s specific content needs (go to “File > Download As >” and select the format you would like). One of the most challenging parts of building your editorial calendar is making sure you have enough relevant ideas to fill the schedule. As you can see in the sample template above, the CMI team also uses our editorial calendar to track the topic ideas we want to try to cover in future content pieces. Keeping a running list of ideas within our calendar spreadsheet makes it an easy reference tool when we need some topic inspiration or starter ideas for brainstorms. Bonus tip 1: Speaking of content curation, Heidi Cohen offers nine ideas for filling your content calendar with compelling curated content. Bonus tip 2: Roger Parker shared a two-part editorial calendar approach (along with a helpful template) that helps marketers choose 12 monthly topics (or themes) in advance for the upcoming year. His process aims to simplify decision-making, and identify relevant, practical topics and schedule tasks far enough in advance to allow timely production and editing. They can be used to help guide customers through complex buying cycles. In his post on editorial planning best practices, Mike Murray shared some of the content details you should be accounting for in your calendaring efforts. They can be used to manage the process of scaling content marketing for use in different geographic regions, as Pam Didner describes in her post, The Holy Grail of Globalizing Editorial Planning. They can be used to align all the content-related efforts of the various teams operating across an enterprise. Sharing your content calendar with your sales, marketing, HR, public relations, or other departments makes it easier for them to understand your efforts – and to alert your team when they are involved in an upcoming event that might inspire new content ideas. The possibilities are practically endless when it comes to ways to use editorial calendars to organize your content marketing and keep your efforts moving in the right direction. What additional tips, tools, and ideas have worked well for your calendaring efforts? If you have other suggestions, please share them with your fellow content marketers in the comments below. Creating and managing an editorial calendar is just one of the templates on CMI. Check out our favorites or subscribe to our weekly newsletter to get new ones as they are published.